AESTHETICALLY PLEASING/PROFESSIONAL LOOK: Not only will your body be in shape, but you will also be in style with this wonderful skipping rope.It is a black rope with grey handles and can be stored and carried around in its grey nylon bag. SUITABLE FOR EVERYONE : Are you working out extremely hard or you have just begun training? This long skipping rope is perfect for you! Cross fitters and boxers will appreciate this rope as well as those who simply love being fit. FULLY ADJUSTABLE: With its 9 foot cable you can jump all you want. It can be adjusted so that it suits your unique body type and work out without any troubles. Anybody can use it , from children to grown ups. So give it a try. 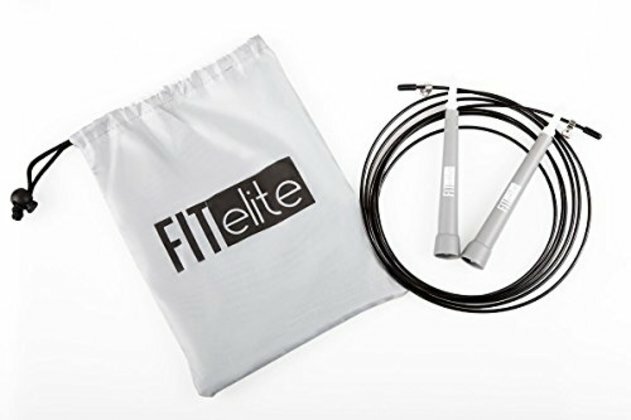 ULTIMATE DURABILITY IN TIME : FITelite jumping rope is smartly designed to last. Because of its durable speed wire cable it withstands harsh daily use and maximum results can be guaranteed . Its lightweight, ergonomic handle design will satisfy you and facilitate your daily workouts. No more wrist injuries for you! UNIQUE 90 DEGREE HANDLE TURN AND WIRE CABLE ROPE: Do you always have problems with tangled or bent jumping ropes? Thanks to FITelite's innovative design you can spin as fast as you want. You don't have to worry about kinking tangling or bending any more. Rest assured about that by buying the best jump rope.